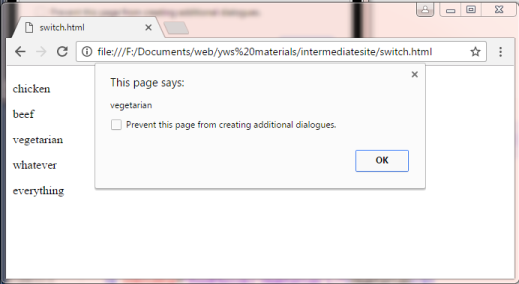 That gives you a page which allows the user to choose a type of food. Don't move on until it works correctly. Remember to use your error console to narrow down where any errors are. Save and try and you should get a different message depending on the choice. You could have used multiple if statements but a switch does it all in one. It looks at the content of the variable and does different things depending on each one The various choices are known as cases. The break line marks the end of what to do if the case matches. The default is what happens if none of the other choices matched. That is why the last two choices give the same alert. Improve this if necessary but adding some instructions for the user and by adding a new case which handles the whatever choice. That means that only people who want all of the meals now get called gluttons. In creating this page you were told to do things which were later not used. The alert and event triggers which were all the same. The reason is that they allowed you to test the individual parts of the page as you went. Always do this (at least until you are perfect). If you test each few lines of code the errors will be easier to find than if you try to test hundreds of lines at the end.